HanseMUN meets UN | HanseMUN e.V. 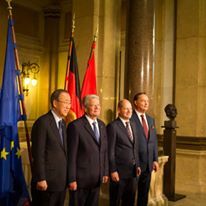 Yesterday, on the occasion of the 20th anniversary of the foundation of the International Tribunal of the Law of the Sea, UN Secretary General Ban Ki-Moon and German President Joachim Gauck came to visit Hamburg. 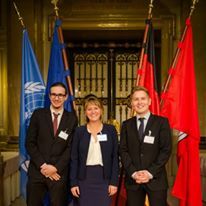 A delegation of HanseMUN followed the ceremony at Hamburg’s City Hall. 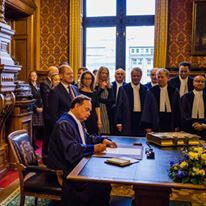 The International Tribunal of the Law of the Sea is a UN institution which was founded under the UnitedNations Convention on the Law of the Sea and began its work at the headquarters in Hamburg in October 1996. President Gauck called the anniversary an “historical event”. 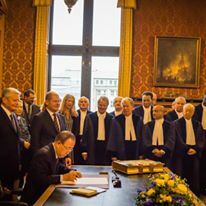 In his speech, he emphasized the importance of international law in general, including not only rights but also duties for all states. He alsoexpressed his concern about the “renaissance of solution finding through the nation state” and thus, the worsened conditions for the further development of international law. Secretary General Ban Ki-Moon surprised the audience with a polite greeting in German. He spoke about the importance of the oceans and the law of the sea, with special reference to Sustainable Development Goal No. 14 – “Life below Water”. Our Delegation, Leo, Clara, and David.